De ces beaux yeux, que la mort me tient pris. Estes-vous pas ma seule Entelechie ? The light of those fair eyes, Death will take me. And movement, my sole Entelechy? Blanchemain favours us with Muret’s note explaining ‘entelechy’: ‘My soul alone, which causes all movement in me, both natural and voluntary. Entelechie, in Greek, signifies perfection. Aristotle teaches that this ‘entelechie’ gives essence and movement to all things.’ I suppose we might translate as ‘my sole perfection’. I love the image of the first tercet – perfection indeed. Blanchemain’s version has a slight change in the first line of the tercet (line 9): “Cela vraiment que l’air est aux oyseaux” (‘That indeed which the air is for birds’). Which saint-like purifies the spirit. Que d’autre bien mon ame n’est goulüe. Quand je l’advise, ou quand je la salüe. Plus doucement qu’amerement nous brule. J’erre là bas sous le bois amoureux. That my soul is greedy for no other. When I see her, or when I greet her. Burns us more gently than bitterly. I wander down below within the wood of lovers. (Fairclough’s translation). You may remember Ronsard among the myrtles in Helen 6(a). Que plus on mange et plus en est goulue. Qu’il m’a du cœur toute peine tollue. That, even as it eats more, it is greedy for more. So much that he has lifted all pain from my heart. To my mind this earlier version transitions better from first to second half; lightened wounds and no pain lead more readily to love not being any kind of trouble, than does blood frozen with fear at seeing or meeting the beloved! But the later version of line 4 is undeniably better. 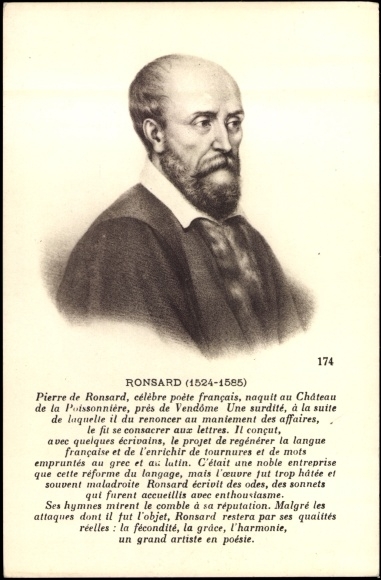 As usual with the changes Ronsard introduced into his poems, you win some and you lose some … ! Antres, prez, fleurs, dites-le luy pour moy. Caves, meadows, flowers – say it to her for me! De tes beautez les honneurs trahissant. Qui m’ard le cœur, vient ma langue enchanter. C’est le destin, et non l’art qui m’abuse. The honour due to your beauties. Which burns my heart has enchanted my tongue. It is fate not art which leads me astray. Here’s another poem which the older Ronsard considerably re-worked. In places you can see why: the early version of line 4 (below) starts “Et ton tetin” which sounds pretty ugly, so “ton beau teint” is a definite improvement. Sometimes you wonder what was behind the change: why is Cassandre’s hair brown in old Ronsard’s memory, when it’s blonde (below) to his younger eyes?! It’s good to see a bit of modesty – even if false modesty – about the power of poetry! But of course the point is that however beautiful the poem – and Ronsard would always claim his own as beautiful – she outshines it. The 2 versions of the final couplet are fascinating for their differences, while retaining the same effect: quite a virtuoso re-working in the late version! De tes beautés les honneurs trahissant. Qui m’ard le cœur me force de chanter. Non l’ouvrier, non, mais son destin, accuse. Which burns my heart forces me to sing. Accuse not the workman, no, but his fate. Le premier jour qu’elle ravit mon ame. On the first day that she stole my soul. Although the Cassandre sonnets are often portrayed as more naive, more confident than the later (Helen) sonnets, in fact I’ve found they’re often just as cynical or just as tongue-in-cheek as the later, arguably more disillusioned, sets. Yet there are certainly occasions when Ronsard offers us a sunny, bright poem that has not a trace of cynicism or disillusionment about it: and here’s one. So neat it is, that even the older Ronsard found nothing in his first thoughts which needed improving! Une eternelle et paisible demeure. POUR AIMER TROP LES BEAUX YEUX DE SA DAME. FOR LOVING TOO MUCH HIS LADY’S FAIR EYES. Regarding line 11, Blanchemain reminds us in a footnote that ‘in Greek an epigram signifies any inscription’ – but an epigram could also be a three line mini-poem such as the last tercet so I’m not sure that it’s necessary to see Ronsard making a Greek allusion here! On the other hand line 4 clearly is a classical allusion, since only in classical myth is the afterlife bordered by a river (the Styx) – and of course ‘below’ rather than in heaven ‘above’. Pour tout jamais eternelle demeure. For all time eternal rest. En ma franchise imprima son œillade. Où l’ame sent une douleur extrème. Au feu d’Amour, victime de moy-mesme. Half-dressed in just her petticoat. Her glance imprinted on my freedom. Where my soul felt extreme pain. On the altar of Love, my own victim. Je me consume au plus verd de mon âge. So I am consumed in the bloom of my youth. EDIT: Some commentators would have it that the ‘meadow’ in the first line is meant to evoke the name of Cassandre’s husband, Jean de Peigné seigneur du Pray: “pré/Pray” sound the same. It’s even been said that Ronsard changed the earlier plural (“prés”/’meadows’) to the singular, to make the allusion clearer. It’s possible, I suppose.